Providing motivated custodial workers to keep your facility looking clean. We listen to the needs of our customers to prioritize tasks in order to provide the highest levels of service possible. Our services adhere to following strategy. Cleaning is done with high attention to detail. Employee productivity is ensured through guidelines and controls. A team approach is used ensure that work is completed efficiently. Facility Services Partners is able to optimize the use of staffing and materials to ensure quality service while adhering to a budget. We use professional equipment that suits the needs of each job site to maximize the productivity of each employee. We also are part of a purchasing consortium that allows us to purchase supplies at a significant discount. Our program assumes responsibility for communication at all levels within the cleaning organization. We use zone and team cleaning methods depending upon the scope of work and the nature of the buildings. Zone cleaning includes inclusive responsibility for an assigned building or area for each cleaning employee. All personnel are cross-rained to accommodate absences or vacation time. Team cleaning assigns a building or an area to a team where each team member has different areas of specialized responsibility. Specialized activities include vacuuming, surface cleaning and dusting, trash pick-up, restroom cleaning, and recycling. FSP has a strong safety orientation. Safety training is provided once per week. Equipment and supplies are color coded for easy identification and correct utilization. The company minimizes the number of chemicals it uses to avoid confusion and promote effective chemical handling. Updated MSDS packets are placed in relatively close proximity throughout the building site to allow quick access should a chemical use problem occur. 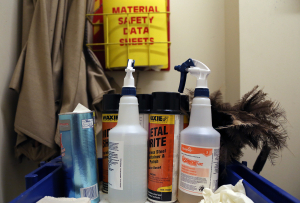 Safe practices are stressed in terms of cleaning techniques, chemical dispensing, and lifting. Safety is a component of employee performance and wage progression. Depending upon the application, FSP uses vacuum cleaners that are attached to a custodian’s back or upright vacuum cleaners. The vacuum cleaners used are ergonomically correct thereby avoiding back and other injuries. Vacuum cleaners have multiple filters that are changed out on a systematic basis. FSP uses a mop with a two-compartment bucket that separates fresh water from dirty water and cross contamination is significantly reduced when only fresh water is used for the mopping process. We also use “flat mops” to eliminate the need to wrestle with messy mops and lug heavy cleaning buckets. These mops also minimize the over use of chemicals. Restroom mops and buckets are not comingled with mops for other floor space. Where merited FSP uses a systematic training program to teach housekeepers a wide array of specialized job responsibilities such as restroom cleaning, blood-borne pathogen training, vacuuming and mopping techniques, safety, and environmentally compliant cleaning practices. The term “clean” is an environmental condition free of unwanted matter in the form of solids, liquids, gases, and living organisms. Housekeepers have the largest impact on building occupants with respect to the indoor environment. The FSP cleaning program supports this responsibility by insuring the use of equipment, supplies, and techniques to remove or reposition unwanted matter so that healthy human activities can take place. After a detailed assessment of the building’s cleaning needs, a building profile is prepared. Cleaning tasks are divided into “routine”, which are items to be done daily, detailing, which are items to be done once per week for all cleaning areas, and “project” work such as carpet extraction, blind cleaning, and floor stripping which is done once per week. Specialist duties are tailored around the building size, layout, and special needs. Team members are then provided job cards to provide a depiction of their duties each day. FSP allows for normal absenteeism and has an Employee Absence Staffing plan in place to adjust schedules to insure that critical housekeeping chores are addressed without providing obsessive demands on the housekeepers. FSP has compliance audits built into the program to require supervisors and managers to review equipment and chemical utilization, work process effectiveness, and the quality of the work. Constant training is provided to insure quality service delivery. 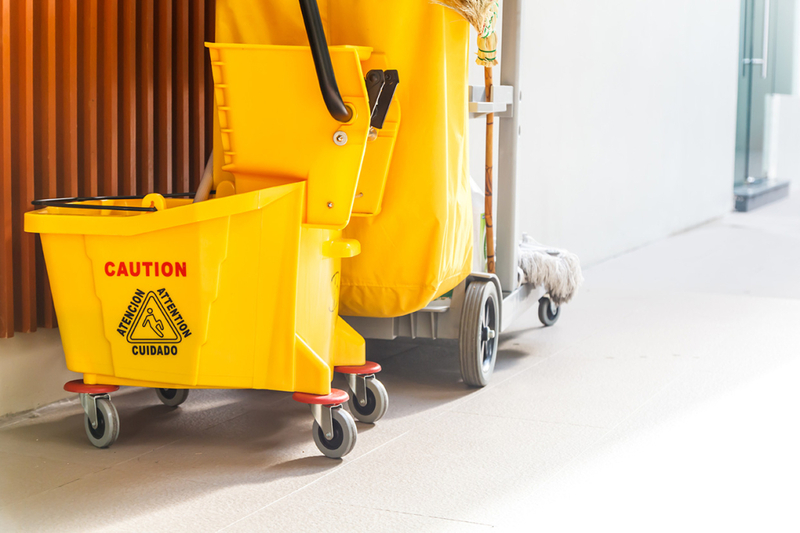 In addition to post work inspection by supervisors, FSP requires each of it custodians to inspect work as it is done to avoid issues and dissatisfaction with cleaning services. The key to success in cleaning is attention to detail, inspections, comprehensive training, morale building, benchmarking performance, measuring cost effectiveness as it relates to the level of cleaning requested, and understanding customer satisfaction with respect to each building and various aspects of the custodial services provided. FSP provides all these capabilities and reports progress in these areas to its clients.